Overall, the property is great. Conveniently located, just a two minute walk from the beach. We had a pool access deluxe room, which was basically a one bedroom apartment. The room was immaculately clean, and very spacious. Had a kitchen area with a sink, full refrigerator and cabinets. Living area with flat screen tv and couch. Bedroom was spacious as well, but bed was a bit hard for my taste. Bathroom had a full size shower and deep jetted bathtub. Hot water ran out pretty quickly however, so I am not sure how the tub would ever be able to fill up with hot, or even warm water. Air conditioner in the bedroom was leaking water on the first day, but then was fixed right away. The pool access was great, we had a corner room, Room 2101, which gave us the corner of the pool which was pretty large. Only complaint is that the pool would get debris from the surrounding trees and we had no access to a skimmer to clean it. I dont think they cleaned the pool daily, as I only saw it being cleaned maybe twice in our 6 night stay. Other than that, everything was great! The first room we were in had a terrible view and a little stink, so we requested to move. The second room Smelled sooo bad like sewer we moved. The third room I tried to take a bath and the bathtub had a leak all over the floor. The last room they “upgraded” us to stunk a little and had a broken hot tub on the balcony. This was all within 24 hours . We checked out early and went to stay at Nook Dee which was 100x better. This hotel would be amazing except they doing construction right next to this hotel. It is not loud, just more of an eyesore. Everything else about this hotel is great! Accommodating staff... Beautiful rooms... Pool area and view is gorgeous. This hotel is amazing big rooms comfortable beds. The roof top pool is beautiful with a great view. The hotel is literally across the street from the beach. The beach is a little crowded in that are but you can easily walk up and done the beach and find a nice spot to sit at. The hotel offers a breakfast you can make part of your package and it was so delicious. They pick different Thai dishes along with regular breakfast items to have at the buffet. The room is very modern and most of all clean. The stag is so helpful and so willing to help you get what you need wether it be directions or an extra towel. The dinner at the restaurant hotel is amazing as well , although obviously a bit more money than the food outside of the hotel. Hotel also a good walking distance from Bangla Road and the main shopping areas. Overall my experience with them was excellent. Charm resort was amazing experience. I would recommend anyone coming to visit Phuket to stay at the charm. The entire staff was hospitable. First time visiting Phuket, The Charm Resort was a nice place to stay, conviently located with a wonderful staff that greeted all guest and attended to all and any needs. There was a breakfast buffet that was included in the room rate I reserved that was delicious and offered many choices. I would recommend The Charm Resort for anybody visiting Phuket/Patong Beach and would stay again in the future. So loud with tour groups and in the breakfast area. Hotel has many problem with electricity: on and off all day. we had to change the room after trying to settle down and rest from long trip. The second room has problem with water leaking thru the walls and some parade ants in the bedroom. After spraying the ants, we had to wait for hours before the smell faded away then the next day still some ants coming back. Moreover, we both got the food poisoning from the room service. We had to go hospital in the next day from vomiting and diarrhea constantly. The night before, one of the manager brought us a apologized fruit basket, which we both had a little then that night around 1 am, it started to kick in. This is a dangerous hotel and people don't like when you make a comment ( a bad one!) WE WON'T GO BACK TO THAT HOTEL AND THAT AREA AGAIN. It's spooky too because its right next to the cemetery. It's also not walkable area: far from restaurants and shops!!! The Charm Resort Phuket places you next to Patong Beach and within a mile (2 km) of other popular attractions like Jungceylon Shopping Center. This 246-room, 4-star resort has an outdoor pool along with free in-room WiFi and free self parking. This resort serves as home to a rooftop bar, along with a restaurant that specializes in international cuisine. Savor a meal from the comfort of your room with room service, or get a quick energy boost at the coffee shop/café. Start each morning with buffet breakfast, available for a fee from 6:30 AM to 10 AM. Guests can expect to find free WiFi and 40-inch a plasma TV with satellite channels and a DVD player. The bathroom offers a rainfall showerhead, hair dryers, and free toiletries. Other standard amenities include a balcony, a refrigerator, and a minibar. 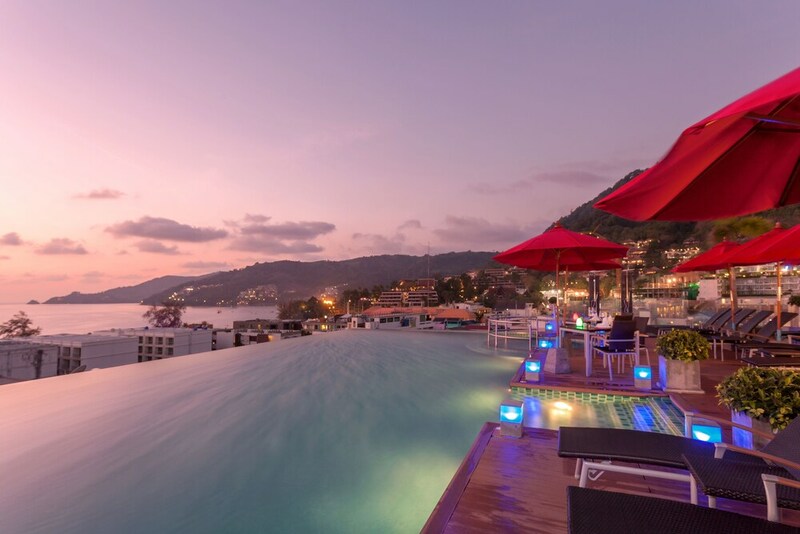 The Charm Resort Phuket features an outdoor pool, a children's pool, and a fitness center. You can take advantage of free parking, along with an airport shuttle (available 24 hours) for THB 1,000 per room. The 24-hour front desk has staff standing by to help with concierge services, luggage storage, and dry cleaning/laundry. Other amenities at this hot springs resort include a sauna, free WiFi in public areas, and coffee/tea in a common area. Thank you for your feedback. Please accept our sincerest apologies for the disappointment you experienced about the service quality. We have taken note of the issues you faced and we will evaluate ways to improve. We hope that we would get a chance to make it up to you on your next stay in Phuket. Dear Sir, We are sorry to hear about this issue. We would bring this to management team and fix it as soon as possible. Looking forward to welcome you soon. We appreciate the feedback very much. Thank you once again for taking the time to write your review. We hope that we would get a chance to make it up to you on your next stay in Phuket. friendly helpful staff and close to beach ! located close to beach and other places to see. Thank you for taking a moment to write your review. A great pleasure having you here and we are pleased that you enjoyed your stay. Your kind and positive feedback are greatly appreciated and we are happy to read that you will consider us on your next visit. Thank you and we look forward to having you here again in the future. Allure Kitchen - Restaurant specializing in international cuisine and serving breakfast, lunch, and dinner. Kid's menu available. Sky bar - Poolside rooftop bar serving brunch and lunch. Lobby lounge - Lobby lounge. The preferred airport is Phuket (HKT-Phuket Intl. ): 31-min drive, 20.8 mi/33.4 km.